Was this where art began? Homo erectus engraving could re-write human history, and might show art began 400,000 years earlier than we knew. A zig-zag, drawn on a shell, could re-write our entire understanding of human origins and art. The pattern, drawn by a homo erectus as long as 540,000 years ago and found recently by an Australian researcher, could change all understandings of our early ancestors. 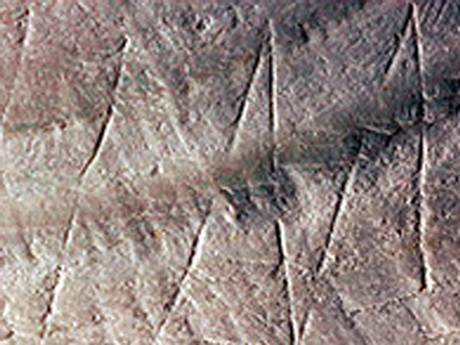 The engraving is at least 300,000 years older than other markings thought to be the oldest made by humans or Neanderthals. The pattern looks like previous finds, but the oldest known of those dates from 100,000 years ago. “It rewrites human history,” said Dr Stephen Munro, from Australian National University, who identified the shell and published the research in Nature this week. “This is the first time we have found evidence for Homo erectus behaving this way,” he said. The age of the rock, and the place it was found, discount earlier theories that the engravings had done by our later ancestors, Neanderthals, or by human beings.